This morning I was eating my breakfast, browsing Pinterest, the usual routine, when I saw this brilliant idea for small world play from In Lieu of Preschool. 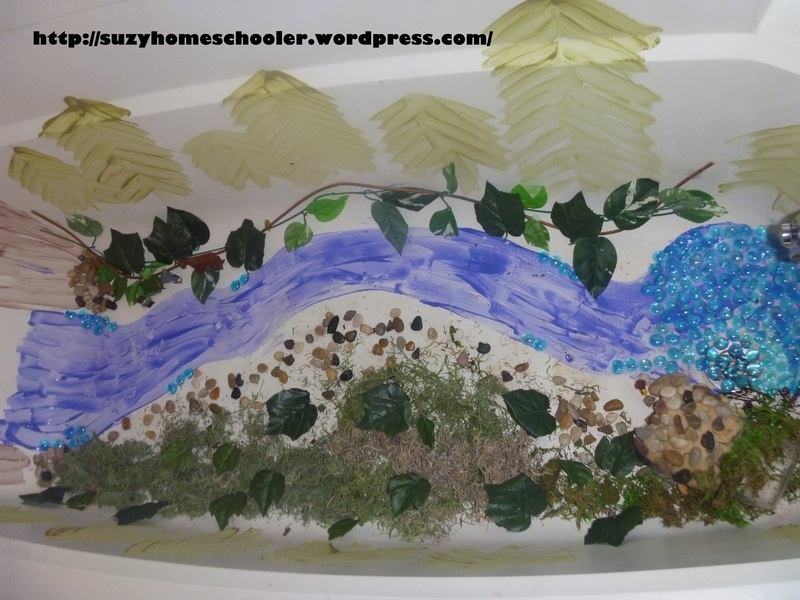 She had set up a wonderful scene by painting her bathtub, then using random crafty items (playdough, pipecleaners, glass gems, etc..) to add details. The end result was FULLY. AWESOME. Only one problem…her scene is based off the book Peter Rabbit. While a wonderful classic children’s story, not something LittleMan would be too terribly interested in. So I pondered. And pondered. And put my own geeky twist on it. 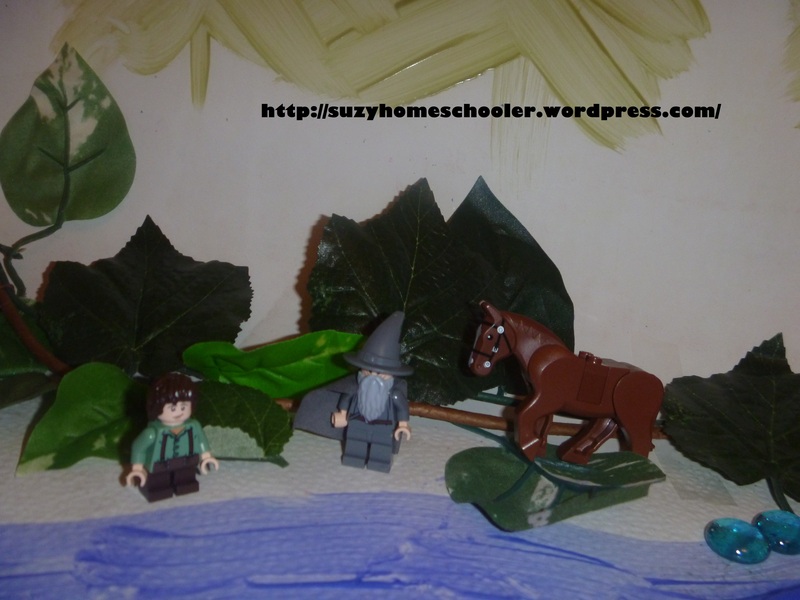 Before I knew what I was doing, I was lamely trying to recreate a classic scene from Middle Earth in my own bath tub. The end result of my poor painting skills was laughable. Luckily I had props to supplement my lack of artistic ability. See for yourself. Some rocks, moss, silk leaves, and blue glass gems really helped out. My favorite part was the cave. I made this by covering the outside and rim of an empty plastic jar with some playdough we had on hand (as always I love keeping a stash of koolaide playdough handy, you never know when you’ll want a project to smell like watermelon-kiwi). Then I pressed some rocks and moss into the playdough. And of course what is Lord of the Rings small world play if you don’t have Gandalf, Frodo Baggins, and the odd elf or horse to play with. LittleMan walked in while I was prepping the scene and immediately wanted to jump in. He played with this scene for nearly 2 hours straight acting out the several scenes from the movie, the cutest of which was Gandalf’s battle against a Balrog. We did eventually convince him to take the moss out of the tub and fill it with water to wash himself. LittleMan enjoyed himself so much [and I had so much fun setting it up] that I’m now pondering what other scenes we might be able to recreate in the bathtub. Asgard? The Death Star? A scene from Super Mario Bros? The possibilities are endless. Huge thank you to In Lieu of Preschool for the inspiration! If you haven’t already checked out her site, you should. 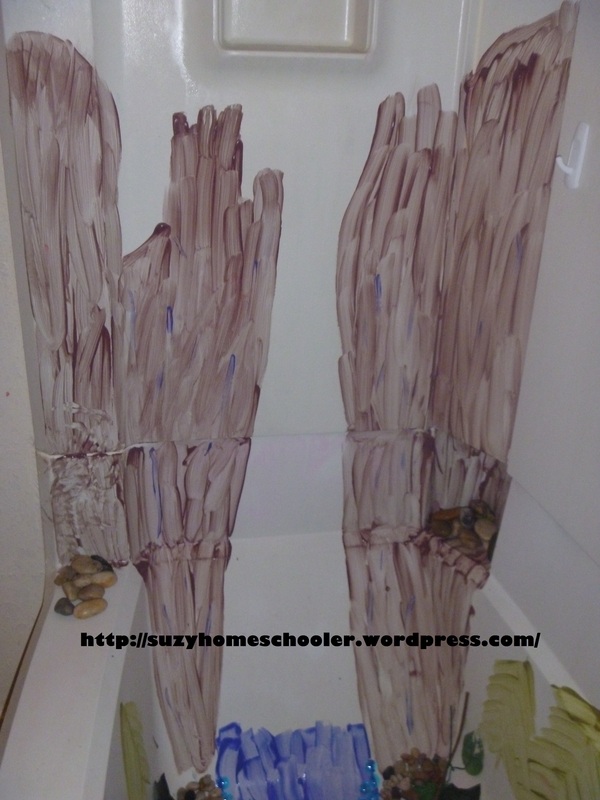 I follow her on Pinterest and she does some really fun, often educational, activities. 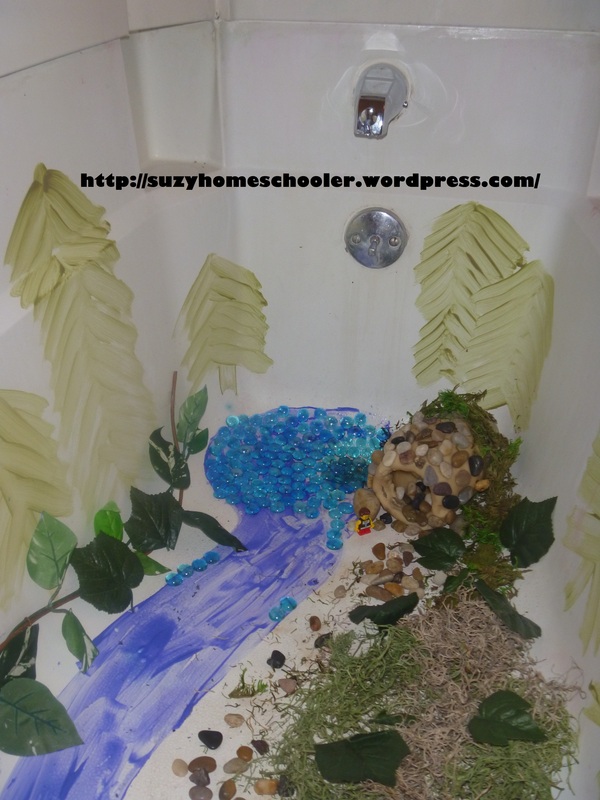 Rain Theme Bath - How Can I Teach My Son to Read….When He Won’t Sit Still? !